RYE, N.Y. (CNS) — The “sacramental sense” of a Catholic pastor’s outreach after the horrific violence that took place at a Connecticut elementary school “has brought the church to bear in the most intimate and powerful way,” said the director of communications for the Diocese of Bridgeport, Conn.
“It’s hard to sum up how powerful his witness and testimony have been, both locally and nationally,” Brian D. Wallace told Catholic News Service in describing Msgr. Robert Weiss, pastor of St. Rose of Lima Church in Newtown. Wallace said Msgr. Weiss was “stunned by the faith of the parents who lost children. People who lose the most sometimes give the most.” He added the courage, openness and determination of the parents is a gift to the priest. Msgr. Weiss, his two priest associates, and men and women from the parish staff have “brought tremendous comfort to families,” Wallace said. Efforts by CNS to reach parish staff members for interviews have been unsuccessful. St. Rose of Lima has taken center stage in the aftermath of the shooting massacre at Sandy Hook Elementary School Dec. 14, which left 20 children and seven adults dead. Parishioners and community members gathered for a prayer vigil the night of the shootings and flocked to Sunday Masses seeking solace. They looked to Msgr. Weiss and his staff and other Catholic leaders for pastoral outreach in the aftermath of the violence. Eighteen children died at the school and two others died after they had been rushed to the hospital. All of the children were first-graders. The adults included the principal and five teachers, as well as the gunman. Police officials identified the shooter as Adam Lanza, 20, and said he killed himself as first responders arrived on the scene. Many of the dead were Catholic and were known in the St. Rose parish family. Wallace said funerals for eight of the children and one of the adults were being scheduled at St. Rose. Two funerals were taking place Dec. 18. Mary Sherlach, the Sandy Hook school psychologist, will be buried from St. Stephen Church in Trumbull, Conn., where she was an active parishioner. The shooter and his mother were members of St. Rose, but there are no plans at this time to hold funerals for either at the Newtown church, Wallace told CNS. The diocesan response to the tragedy is based on its experience with earlier traumatic events. Its Catholic Charities agency has a crisis team that works closely with the diocesan safe environments staff. “Catholic Charities has a very strong behavioral health component, staffed by Catholic professionals. Over the last 10 years, it has evolved as a resource to deal with crises,” Wallace said. Priests from neighboring parishes responded immediately to the crisis and helped the pastoral staff at St. Rose console families and concelebrate Mass, according to Wallace. Archbishop William E. Lori of Baltimore, who was bishop of Bridgeport from 2001 until March, when he was named to Baltimore, was in Rome at the time of the shooting. Wallace said the people of the parish are “very much in the bishop’s heart and he will meet with them” in the near future. Msgr. 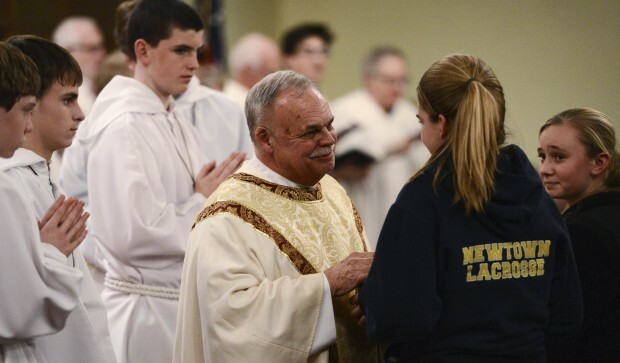 Jerald A. Doyle, the administrator of the diocese, celebrated Mass at St. Rose Dec 16. St. Rose of Lima is a parish of 3,200 families in a town of 27,000 people. Wallace called it “storybook America,” a town that grew from a population of 10,000 30 years ago. “For all the change and growth, it still has a hometown feel,” he said. Classes at the parish’s K-8 school were canceled for the week in the interest of protecting the students from the sight of twice daily funerals at the church, Wallace said. The shooter was briefly enrolled in the parish school as a child. Wallace noted that more than 100 representatives of the secular media were at St. Rose of Lima Church for the Dec. 14 prayer service. He said most were extremely respectful and responsive and comforted by Msgr. Weiss’s healing presence. Some identified themselves as parents and people of faith, he said.